Smilax rotundifolia. Copyright © 2014 Albert Bussewitz.New England Wild Flower Society.gobotany.newenglandwild.org. Smilax rotundifolia is a slender, woody vine, monocotyledon, prickles stout, flattened, straight; colonial from extensive rhizome mat and large tubers; climbs fairly high, stems green, stout to slender, tendrils often paired and branched, arising from base of leaf stalk, stems of woody monocotyledons do not increase in diameter with age. Leaves alternate, stalk slightly sheathing at base, blade 5-10 cm long, 4-9 cm wide, usually broadly egg-shaped to rounded, tip blunt to short pointed, base rounded to lobed, shiny-green above, green below, rounded, major veins 5-7, palmate, secondary veins netted; leaves expand early-mid-May; deciduous, plant leafless 180 days (Britton 1874). Flowers greenish, small, petals and sepals the same, 3 each, in small, umbrella-shaped clusters in axils, inflorescence stalk about as long as leaf stalks, males and females on separate plants (dioecious); May-June. 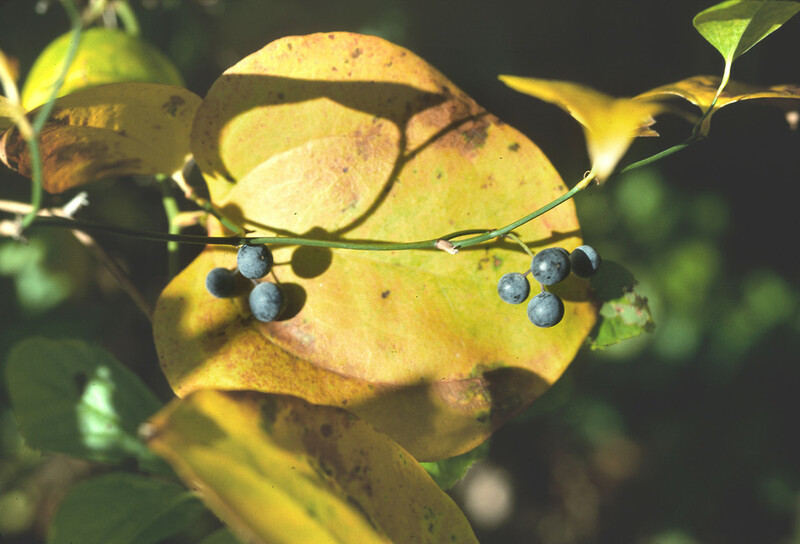 Fruit fleshy, blue-black with a waxy bloom, 2-3 seeds, Sept.-Oct., persists through winter. Seed load 38%. Pulp nutrients: water 75%, Lipid <1%, protein 6%, CHO 18% (White 1989). Fruit eaten and seeds dispersed by birds, also by mammals including bears, raccoons, skunks and opossums (Wilson 1993). 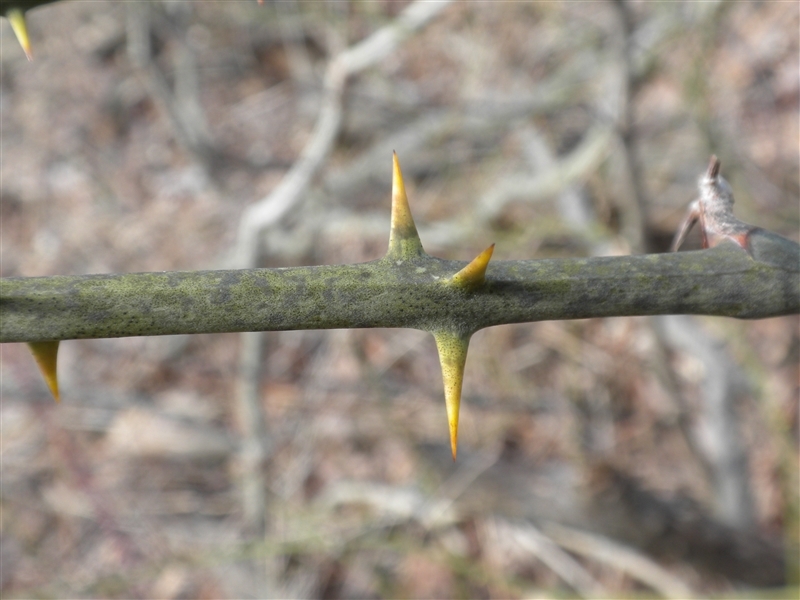 Stems and foliage eaten by deer, rabbits. 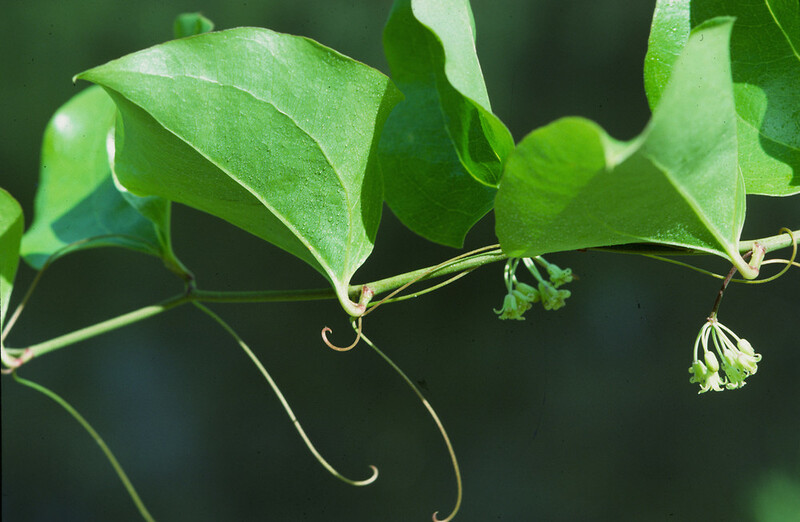 Smilax rotundifolia.R. Shipper.University of Michigan Herbarium.michiganflora.net (All Accessed 7/2014). Habitat: Disturbed woodlands. Tolerates wet soil, shade. Rhizomes form dense mats under soil surface. Vines can form monocultures on burned over woodlands if rhizomes are not killed by fire. 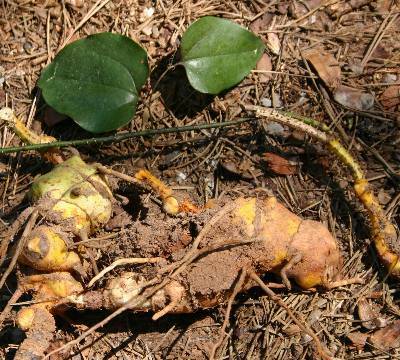 Smilax rotundifolia.Tuber.Dan De Lion.Return to Nature.returntonature.us (Accessed 3/2017). Notes: Appears to retard but not prevent forest regeneration (personal observation). Found in forest soil pH 4.4-5.6 (Gargiullo unpublished data).